Myth: The reason there is no Nobel Price for Mathematics is because Alfred Nobel’s fiancée wife had an affair with a mathematician. While that’s a nice anecdote to tell a classroom of sleepy Limits and Infinite Series students, like so many other such historical anecdotes, it simply isn’t true. Nobel himself never married, though he did propose to one woman, Alexandra, who turned him down. He later had a relationship with his secretary Bertha Kinsky, which eventually ended with her leaving him to marry her former lover, Baron Arthur Gundaccar von Suttner. In this case, Nobel and Kinsky remained very close friends for the rest of his life. The third “love of his life” was Sophie Hess, whom he maintained a relationship with for around 18 years; he also referred to her as “Madame Sofie Nobel” in letters, even though they were never married. Aside from these women, there is no record of him having any significant love affair with any other woman than those listed above. The first one who rejected him did so early on in his life and there was no record that she then ended up marrying or having a relationship with any mathematician, so it is unlikely that any long standing grudge developed from this. He remained friends with the second woman throughout his life, so likely no animosity there. For the third woman who he had an 18 year relationship with, numerous letters between she and himself are still around and they don’t mention or allude to any affairs. It is also sometimes suggested as “proof” that something to the effect of the above anecdote took place because in his last revision to his will, Nobel got rid of a 5% bequeathal of his estate to what is now the University of Stockholm; the rumor is that he did so because of a feud with the a fore mentioned Mittag-Leffler, who he at least knew of from the “Stockholm educated society”. However, there is no record of such a feud and it isn’t clear if the two actually ever even met, given Mittag-Leffler was a student when Nobel left Sweden and Nobel only returned about once a year for his mother’s birthday. It should also be noted that Nobel frequently revised his will throughout his lifetime and, on that same above revision where he got rid of the 5% to the present day University of Stockholm, he also got rid of most of his educational donations to other schools, not just the above where Mittag-Leffler taught. He was simply shifting his focus to giving more of his estate to the Nobel Prizes, rather than to educational institutions. The more mundane reasoning behind him not selecting mathematics for a Nobel prize is thought to be simply that Nobel wasn’t very interested in the subject and didn’t grasp the practical benefits to the world of advanced mathematics. The Nobel Prizes were created as awards for people who made the greatest contributions to mankind in subjects that interested Nobel. So it would seem Nobel just didn’t see the benefit in providing one for mathematics, a subject he didn’t care for anyways, and, rather, he stuck to ones he understood well the benefits to mankind and subjects he was more interested in: Physics, Chemistry, Medicine, Literature, and Peace. Nobel did a lot of his own work in Physics and Chemistry and was an enthusiast of various literature of the day. He also saw the benefit to advancements in medicine. The “peace” prize was thought to have been suggested and promoted by his former lover and secretary Bertha Kinsky, who later won the award in 1905, just a few years after the Nobel Prizes were established. The peace prize would have also appealed to him, as he had a reputation as a war monger, and a huge point to the Nobel Prizes was to fix his reputation as a “merchant of death”. The above is the generally accepted theory based on historical records, however, an alternative theory is sometimes suggested, though it is pure speculation. At the time, there already existed a major mathematical award that was actually established at the behest of Mittag-Leffler himself. Mittag-Leffler persuaded King Oscar II to create an endowment prize for various mathematicians throughout Europe. Thus, Nobel may have simply not wanted to try and compete with that established award with his own. Rather, he focused his funds on fields that interested him that didn’t already have prestigious awards attached. Nobel ended up donating a full 94% of his fortune (about $235 million out of $250 million, adjusted for inflation) to be used for the Nobel prizes. He came up with the idea of using his money this way after his brother, Ludvig, died in 1888 and a French newspaper mistakenly thought it had been Alfred Nobel himself who died and published: “The merchant of death is dead”. Thus, Nobel began thinking of how to improve his public image and decided on the Nobel Prizes. There is a prize for mathematics that is equivalent to a Nobel Prize. I know what you’re thinking, “sure, the Fields Medal”. In fact though, the equivalent award is the prestigious Abel Prize. The Abel Prize is given out annually by the King of Norway with winners selected by a panel of five international mathematicians. It is named after Niels Henrik Abel, who was a distinguished Norwegian mathematician who lived in the early 19th century. The award includes a cash prize of close to $1 million. The Fields Medal, on the other hand, only includes a cash prize of about $15,000 and is awarded every four years and typically is not awarded for a single great achievement, but rather for a body of work. Further, the Fields Medal is only given to those under the age of 40 and 2-4 mathematicians each time win the award. The Abel prize was first proposed around the same time as the Nobel Prize. Sophus Lie proposed it when he learned of Alfred Nobel’s prizes and that Nobel had omitted mathematics. However, the interest in creating this prize went away after the Union between Sweden and Norway ended in 1905. It was later picked up, however, and the annual award was eventually established in 2002, the two hundredth anniversary of Abel’s birth. The Fields medal was founded at the encouragement of Canadian mathematician John Charles Fields in 1936. 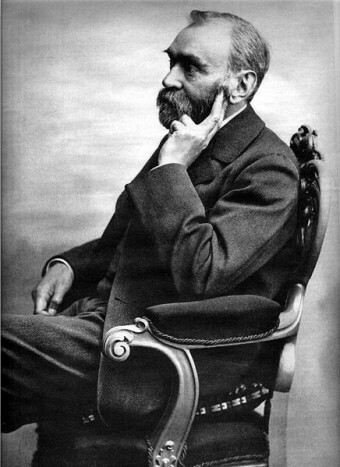 Alfred Nobel invented around 355 things, most notable was his invention of dynamite, in 1867, which he was originally going to call “Nobel’s Safety Powder”, as it was basically a safer version of nitroglycerin and he was attempting to improve his image as a maker of dangerous explosives. He ultimately went with “dynamite”, which was derived from Greek, meaning “power”. Nobel also invented “ballistite”, which was the precursor to quite a lot of military grade explosive devices. Along with the groups setup to select the winners of the Nobel Prizes, a separate group, The Nobel Foundation, was founded to manage Nobel’s money. To date, along with annually bequeathing money to award winners, The Nobel Foundation has grown Nobel’s assets up to around half a billion dollars. This may seem an extremely poor improvement over the $250 million they started with over 100 years ago, particularly considering they operate tax free. However, that “$250 million” is already adjusted for inflation and they invest very conservatively to make sure to be able to maintain the Nobel Prize awards for years to come. And of course, they annually dole out quite large prizes to recipients. Each recipient of a Nobel Prize receives a gold medal (18 carat green gold which is then plated with 24 carat gold), a certificate, and some amount of money which varies from year to year. In 2009, that sum was about $1.4 million. Up to three people can share an award. When this happens, it is up to the awarding body to decide how the money is divided amongst the winners. Most winners end up donating their award money to various causes and charities. Mother Theresa even refused to go to the award dinner, stating that the money could be better used elsewhere. The $7000 that the award dinner costs was then donated to a charity in her name and the dinner was canceled. Upon winning the award, each recipient is required to give a public lecture within six months of receiving the award. The lecture is to be on a subject related to the prize they won. To date, four people have won a Nobel Prize twice. Those include: Maria Sklodowska-Curie (1903 and 1911, for discovery of radioactivity (physics) and later for isolating pure radium (chemistry)); John Bardeen (1956 and 1972, for invention of the transistor (physics) and for coming up with the theory of superconductivity(physics)); Linus Pauling (1954 and 1962, for research into the chemical bond in terms of complex substances (chemistry) and for anti-nuclear activism (peace)); and Frederick Sanger (1958 and 1980, for discovering the structure of the insulin molecule (chemistry) and inventing a method to determine base sequences in DNA (chemistry)). Not only did Maria Curie win two Nobel Prizes, but her family has been the recipient of five total Nobel Prizes. She won two, her husband, Pierre Curie, won one. Her daughter, Irène Joliot-Curie, won the Chemistry Prize in 1935 with her husband. Her second daughter was also the director of UNICEF when it won the Nobel Peace Prize in 1965. Curie’s notes from the 1890s are still today considered too dangerous to handle without protection due to the high levels of radioactivity. They are stored in lead-lined boxes. Neither she or her husband, of course, knew anything about that and handled radioactive items all the time in their research. She eventually paid the price for this, dieing from aplastic anemia. Her husband was killed after being run over by a horse drawn carriage some 28 years before Marie Curie herself died.